The current resurgence of jazz in all its' forms has certainly been impossible to ignore in recent times - from the chart-bound, mainstream crooning of Gregory Porter, to the left field 'jazz not jazz' soundscapes of Kamasi Washington, Moses Boyd, Nubya Garcia and Snarky Puppy proves this is a worldwide phenomenon. One artist who has been been ploughing this furrow in the southern hemisphere for longer than most is Lance Ferguson. As the driving force behind The Bamboos, Cookin' On 3 Burners, Lanu, and the Black Feeling series, these are the varied and versatile projects on which he has built an enviable reputation. 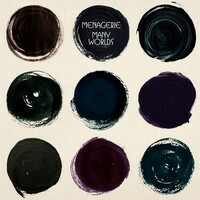 Menagerie 'They Shall Inherit' saw the light of day in 2012 (Tru Thoughts Records) and established the fact that jazz of the contemporary type could reach back to it's essential roots and present itself, refreshed and vital for a contemporary audience. Lance himself explains: "The Arrow Of Time' draws its inspiration conceptually from the themes of space exploration, human evolution and the future of humankind. It's pretty big stuff to be underpinning an album of modal Jazz tunes - but the main message is one of hope, and I hope that comes across in the music"
Late 2017 saw the 2 track album sampler 'Evolution/Arrow Of Time' create a genuine buzz of anticipation, being playlisted on Jazz FM, and also supported by Jamie Cullum (BBC Radio 2) and both Don Letts & Gilles Peterson on their BBC 6 Music shows - having as it does the spirit of deep jazz, but combining an accessible sound that reached way beyond the usual jazz hungry audience - due in one part to Evolution's immensely catchy hooks, with the voice of Fallon Williams focusing the listeners attention on the philosophical themes Lance highlighted above. Now the album, laid out in its' entirety can be experienced, attempting to encapsulate the music with the written word feels like a somewhat futile exercise, so it is best to consider Lance Fergusons' final thoughts about its inspiration, influences and ongoing appeal. "The sound of record labels like Strata East, Tribe and Black Jazz has been a massive influence on Menagerie. To me that sound is timeless, exciting and just as vibrant as a musical format in 2018 - and the proof is that we're hearing more and more young musicians embracing it"